"So, what do you do?"….. The classic (and not to mention sometimes cliché and awkward!) question we've all faced many times at BBQs and other social gatherings. But imagine for a moment that everyone was clear about their career direction, had the skills and know-how to get there and had the required mindset to succeed. That question would be much less awkward and would allow for some really inspired career related discussions. Unfortunately though, the complex and rapidly changing nature of the world of work means that this isn't be the case for most individuals. While many professionals may achieve this state of clarity independently, the rest of us require a guiding hand, a nudge or sometimes a shove, to move us in the right direction. Our privileged role is to assist professionals to provide a sense of clarity and remove the perceived barriers that prevent individuals from mapping out an extraordinary career. The power of our tailored career development process is the self-insight and confidence that the program inspires. So, when should career development be used? Over the past two decades we have delivered thousands of career coaching programs to help individuals at various points throughout their career. The common theme which has emerged is that people need the most help at the critical transition points in their career. It is at these junctures that people benefit most from career coaching. Career Plateau can be quite an apt metaphor for how people can feel at times throughout their career. It’s a flat period when it just doesn’t feel like anything is happening. A career plateau is formally defined by Feldmen and Weiz as a time when an employee considers their likelihood of receiving assignments of increased responsibility as low. Interestingly, this isn’t always a bad thing! Sometimes it is beneficial to have a ‘levelling-off’ period to sustain further growth and development. It is more common, however, that individuals feel that they are unable to realise their full potential. They feel ‘stuck’ and unable to grow and change as the environment around them – including their organisation – changes. Individual skills and abilities: I don’t feel like I’m learning anything new. Individual needs and values: My values are not being met. Lack of intrinsic motivation: I’m just not excited about work. Lack of extrinsic rewards: I just don’t feel valued here anymore. Stress and burnout: I just can’t keep going like this. Slow organisational growth: I want to move faster but we are so slow here. A career plateau can contribute to a drop in the motivation, engagement and productivity of an employee, and where protracted or the result of stress and burnout, can be a symptom of a much larger problem for the organisation and individual. Career development interventions can be instrumental in identifying career plateau’s early and in helping employees to re-engage with their roles and continue their career development. There is an implicit societal expectation that we should know what we want to do in the future. This stems from the questions we are asked at school about what our plans are after school and then at every BBQ we attend: “so what do you do?”. It is common for people to feel a sense of failure if they don’t know exactly what they want to do. However, this is normal. When 75% of the jobs that will exist in 5 years haven’t been created yet how can we know? The world of work is changing too rapidly. To solve this, we recommend career development activities that assist employees to identify their preferred career directions. These are the possibilities for the future and are worth exploring simultaneously. Over time, one or more of these possibilities crystalise as the ideal direction, giving the employee direction and a path to follow for a period of time. Identifying your preferred career directions involves understanding your strengths, your drivers and then testing the possibilities in the market. It also requires individuals to be realistic and open to opportunities that they weren’t necessarily expecting. Sometimes there just aren’t the right jobs available, such as when we choose to live in a regional location and sometimes the right job is there waiting for you but you haven’t recognised it yet. Career development activities provide employees with an increased knowledge of jobs and career possibilities within their organisation and as a result, improve employee retetion. If employees can see a clear path for development within an organisation they are far more likely to remain with their employer. Being promoted into a new leadership role is daunting. It requires a completely different mindset and a nuanced change in behaviour. This applies equally to the step into a first-time leadership role, a new general management role or a new executive position. Each is a quantum shift. And most leaders are unprepared. An increasing number of leaders have been underperforming in these roles over the past decade. We surmise this is because of the delayering that has occurred in organisations, meaning that the step up to the next leadership level is now a greater leap than it was ten years ago. Reflexivity: The ability to constantly reflect upon your actions, your impact on others and adjust your mindset. Leadership is an emotional labour. It is easy to burn yourself – and others – out. Adaptability: You don’t actually get leadership right. It’s a journey of experiences that make you a better leader. Be prepared to be out of your comfort zone. Regularly. Too often we see people choose a leadership path because it appears to be the next logical option. We argue that the leadership role is too important and too challenging to take on lightly or for the wrong reasons. Career development programs can support leaders to align their own personal goals, values and aspirations to the requirements of their roles and to find intrinsic motivation and reward in their work. Career decisions are difficult. Their complexity arises from the fact that our career and life are so intricately linked. There are so many factors to consider (financial, working hours etc) that often people simply choose the first thing that comes along, rather than the best option. This is called the satisficing decision-making model which results in a practical outcome, not the best outcome. What career options play to my strengths and connect with my values? Which options move me toward or away from my preferred career direction? How does my life situation impact on my decision? Are there any barriers to me making this career decision? The last question about barriers is crucial. A common mistake is people jump to a decision when they don’t have all the information to make the decision in the first place. Staying in the uncertainty for a bit longer can yield far better decisions. A career coach can be an invaluable ally and source of challenge and support as people move through this decision-making process. 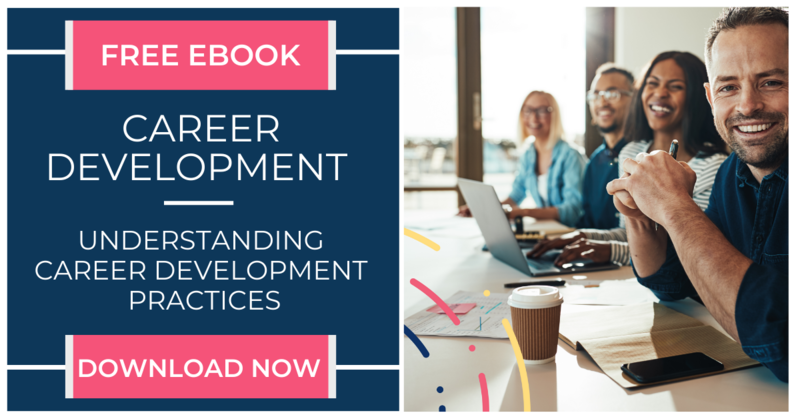 Career development interventions can help ensure that your employees are making the best possible decisions about their careers, rather than simply taking the next available option. It is strange that we believe that work should be one continuous unbroken thread of activity. For centuries, academics have taken extended leave every seven years or so to pursue further research, travelling and recuperation. Called a sabbatical, it still exists today. A 2007 study showed that 47% of women had stopped working at some point in their career. Interestingly though, only 35% cited child rearing as their sole reason for opting out of work. For the majority, their decisions to step out was about a change in career focus and finding sense of fulfillment and success that had to-date been missing. Maternity and paternity leave is the most common and, arguably, the most challenging of career breaks when it comes to getting back into the workforce. Diffusion of networks: The longer the time out the weaker our networks become. Skills and competencies not up to date: The world is moving fast and often those who have been out of the workforce perceive their skills to be outdated. Sometimes they are, sometimes it’s just a perception. Lack of part time roles: Employers remain inflexible with creating alternative forms of employment. It is challenging to convince them otherwise. Balancing family responsibilities: Especially for women entering back into the workforce after maternity leave, this is difficult. Caring for young children, often ageing parents and then work on top is a daunting challenge. From a workforce planning perspective, this cohort of talent is too often ignored. It isn’t malicious but rather a case of 'out of sight out of mind’. We’ve seen great outcomes where a formal program provides career support and encouragement for individuals to reach out and connect with their organisation and vice versa whilst they are taking time away from the workforce. Similarly, career development interventions can speed up and ease the transition back to the workplace, decreasing the time it takes for these individuals to ‘come up to speed’. “It’s time to retire retirement” is the title of a 2004 Harvard Business Review article. So true. The notion of suddenly stopping work at age 65 is outdated. Once we get to the privileged point in life of not having to work for money then our career becomes about what we contribute. An ideal retirement is a portfolio career of activities some of which are paid, some are not. It’s about spending time with people you like and about doing the activities that give you a sense of meaning. I’ll never forget Ken whom I met when he was 75. He was the Rotary Club president, consulted to organisations on strategy, was a member of the golf club committee, held 2 advisory board positions and was writing a book. I said to him one day “Ken, you are so busy, when are you going to retire?”. He looked at me and replied, “I am retired. Being retired is doing the things you love doing.” What a great definition of retirement. Doing the things you love doing. Career development interventions are a useful tool in maintaining the engagement and contribution of employees as they prepare to retire, facilitating the transfer of knowledge and expertise prior to the employee’s retirement and preparing the individual for this next phase of their career. With youth unemployment at 13%, transitioning from school or university to work is difficult. We spend a lot of time with graduates who are unprepared for the transition to employment. They most common mistake is not doing enough preparation while still studying. We advise students of any age to start the job search at the start of their degree, where they can work in a relevant office based administration role or take up an internship during their study. Critical activities include learning career management skills, building a network into industry, undertaking work experiences and finding mentors to sponsor students into organisations. A forced career change is difficult because often we are unprepared for the change. When a change comes sooner than expected, it requires significant effort and energy to readjust and recommit to your career. There are two main forced career changes. First, redundancy is almost always unexpected. Employees in Australia will be retrenched about three times in their career. It’s just part of the world of work. Here are some tips to navigate a redundancy. Second, forced relocation is common with dual-career couples where one person is transferred overseas, or offered a promotion in another location. These changes are complex. Linda Gottfredson’s well known career theory is called “Circumspection and Compromise” and she highlights that career decisions always involve an opportunity cost. This is especially so with dual career couples where each person has to compromise their career for a period of time to allow the other person to move ahead. Hopefully, across a life span, these balance out. Career development interventions, and particularly career coaching, can be an important source of support for individuals as they navigate these difficult decisions and transitions. Career development programs and initiatives provide clarity for individuals at many junctures throughout their career, as they encourage insight and awareness into oneself and allow for the exploration of future possibilities and opportunities. Regardless of an individual's age, gender, role or industry, career development programs assist to reduce the difficulty employees face moving through these different career stages. In the process, the organisation is likely to benefit from increased attraction, retention and motivation of staff in the long term. At the very least, the clarity and insight gained from a career development program will help individuals prepare for and navigate the inevitable BBQ question ".... so, what do you do? ".